Hey everybody, here's a lot of stuff! 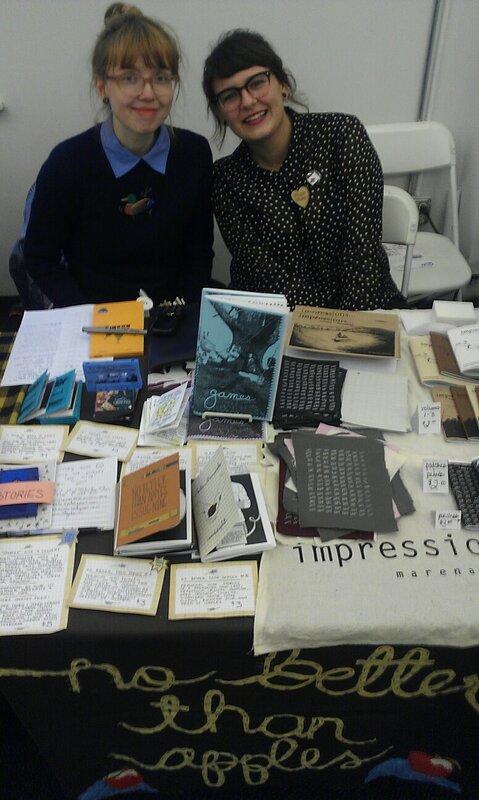 Chicago Zine Fest was great! Two 15-hour drives barely even made a dent in me and Marena. Drinking deplorable amounts of (even more deplorable) coffee is to be credited heavily. This was the truck stop where I got really excited about all the novelty cheap-as-sin children toys you can buy (plastic food, a bag of tiny plastic dinosaurs, more plastic stuff encased in plastic), and saw a souped-up little camaro with "BONECRUSHER" decals all over it. On long drives, you gotta notice this stuff. Make the stops count. 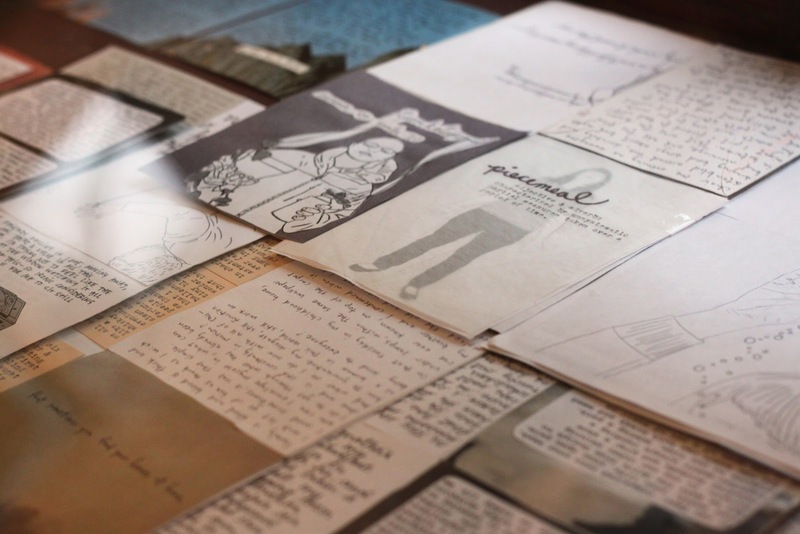 I sold out of the story zines, and started an e-mail list of people who were interested for when/if I make a 2nd run of them. If you missed out on the first batch, send me an email (teamkate@gmail.com) and I'll send you a message once they are ready! They were making *free* pour-over coffees down the hall from my table! This is really important to mention, right? I want to make some joke about zinesters and free coffee and how fast the two envelope each other, but all the punch lines feel too obvious/dumb. While I was there I fit in a visit to the bean (my favorite large-scale reflective outdoor sculpture in this world) and the SAIC art museum, where I got way too excited about a room full of glass floral paperweights. I read way too personal stuff in front of way too many people and didn't even puke! It's the small things that count. I ate amazing breakfasts, sang karaoke, saw old friends, made new ones, managed to spend lots of time with my brother, and came home with a bunch of new reading material. What's cool about zine fests is that you get to take friends back home with you via their zines. Everyone I met was way too kind to me all weekend, and it melted my cold hard heart. 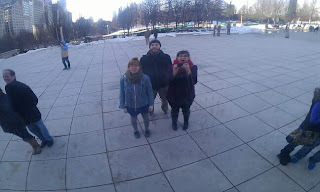 Thanks Chicago Zine Fest Organizers, you angels. Thanks Chicago! When I returned, I did a reading with Jacinta Bunnell, Cassie J. Sneider, and Nicole J. Georges, and that was real nice! They are amazing. I was so glad to have them in New Paltz and to be able to read alongside of them. I also got to work gathering stuff for the Team Love art show when I got back into town. 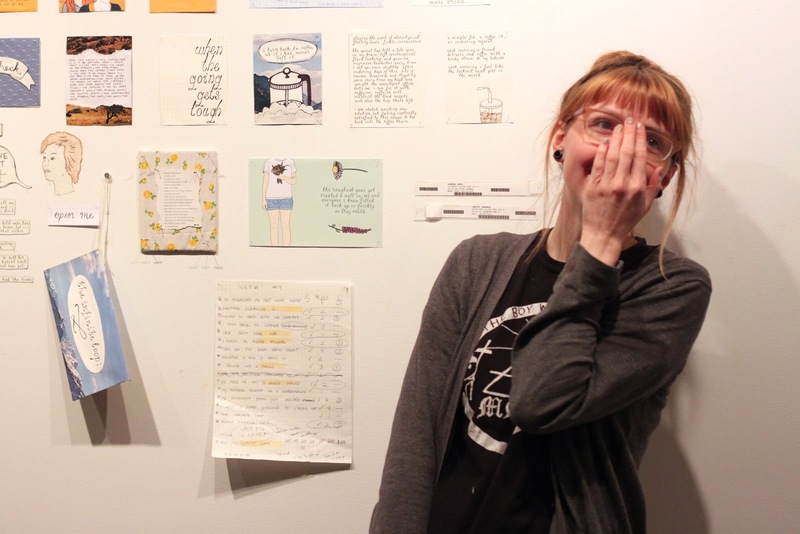 My wall of the show was mostly focused on the creative process behind my last zine: it includes master pages from the zine itself, pages re-constructed into new/different pieces, and pieces and words that didn't make the final cut. I spilled my guts/pinned a lot of tiny stuff to their walls, basically. I also have piles of older zine master pages on display, as well as stuff hung up from past zines, and a little "what's a zine?" primer I drew up, for anyone who may be un-acquainted with the medium! 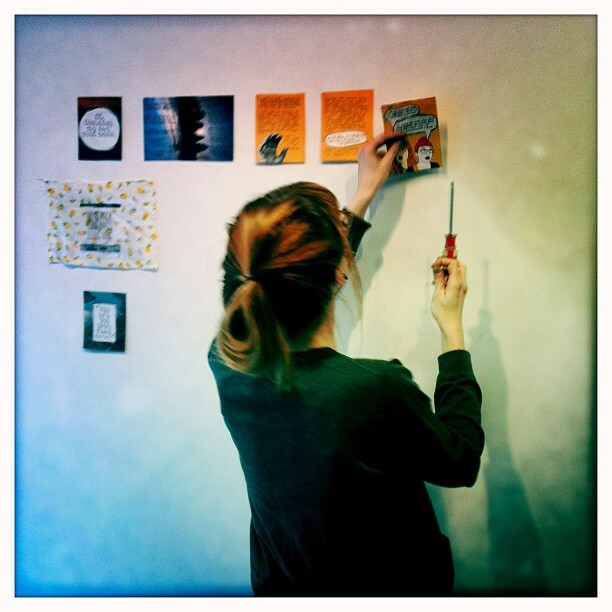 Jacinta has some awesome work on the wall adjacent! 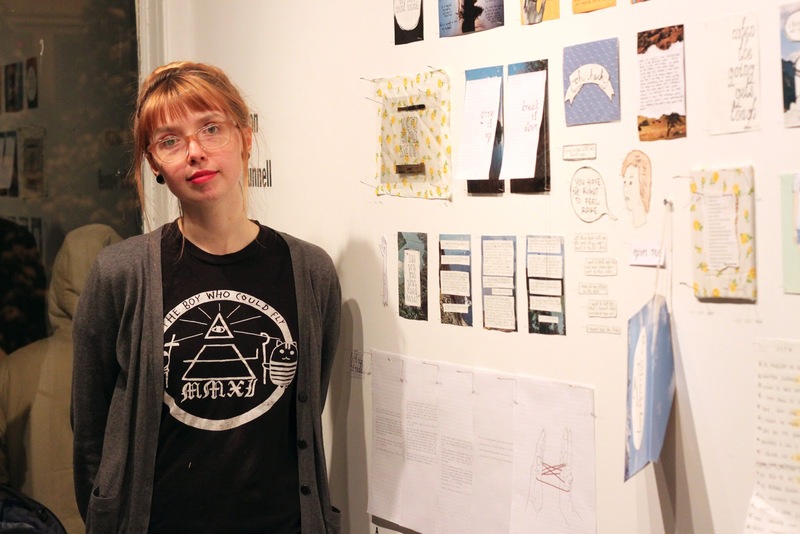 It's up until May, and they're open Fridays - Sundays from 12-6pm, and by appointment, which they encourage you making. 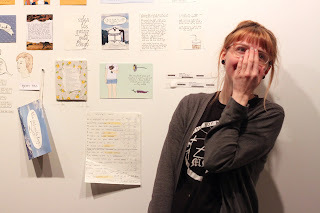 The opening felt really perfect: a total complete overload of friends and strangers convening to hang out, look at stuff, see Helen Money absolutely tear it up, and (whether they knew it or not) make me feel really great. And eat snacks, which is a major (the most major?) part of what I like about any social gathering. 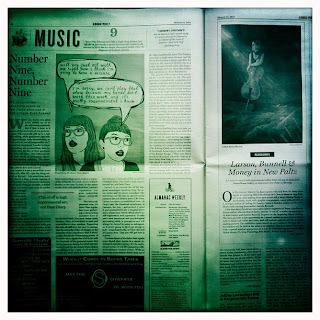 John Burdick wrote a piece on me for the Hudson Valley Almanac. 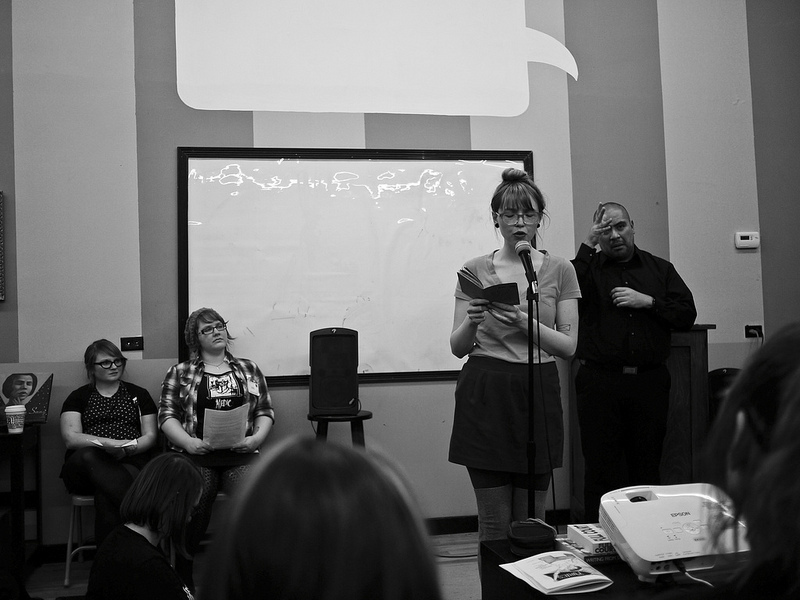 In it he likens me to Spalding Gray and Lynda Barry which makes me pretty much explode, as they're some of my favorite writer/artists who live on comfy clouds far above my head. You can read it online if you want (make sure you click the well-hidden "2" at the bottom of the page for the 2nd page of it: otherwise, you'll think the whole thing wraps up rather abruptly), and it's in the print Almanac, too! I'll be teaching a zine-making workshop to kids at next week's Burningtown Makerspace "Maker Meet-up!" It's on Tuesday, March 26th, from 2:30 to 6:30 at the Marbletown Multi-Arts Center in Stone Ridge. It's for kids ages 5-14 (and kids at heart, duh), and I'll be there with paper and markers and glue and glitter and encouragement and everything you need to put your creativity to work on a zine! I'm really really excited about this. Really. My zines are at Boxcar Books in Bloomington, Indiana, now. If you're around those parts you could go visit them there, then go eat really good thai food at that place I can't remember the name of! How helpful. My latest zine is also now in stock with TwelveOhTwo zine distro, based out of Toronto. Go Ogres are playing a show in Ithaca at the Chapter House on April 6th. More details on that when I've got them. 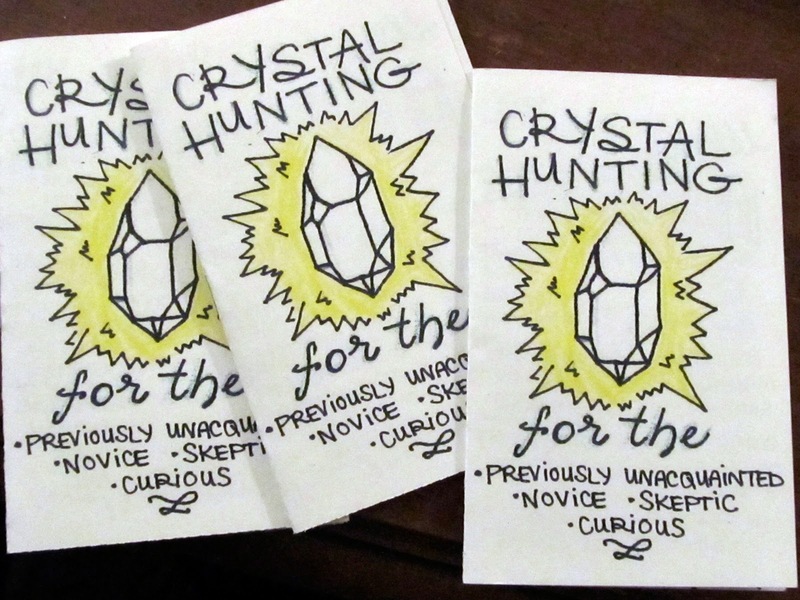 Before I went to Chicago, I made a mini how-to zine all about the practice of crystal hunting. The how/what/why/when/where of it all, because nothing's more satisfying than pulling a quartz crystal straight outta the earth, you know? Read up/get wise/start your own jar of foraged crystals, ASAP. 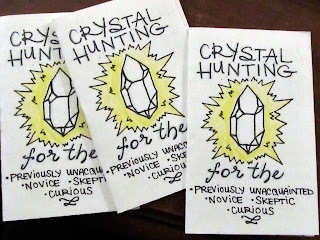 I made them to accompany the "I'd rather be crystal hunting" t-shirts I made once upon a time. I'll be printing up another run of those one of these days! The Defiant Daughters books have been printed and are out there in the world now! Neatest thing ever to see your own name & words in print and not having to hang over the photocopier to get it all made. And to be in a book with so many other amazing women writing about the important stuff? Pretty sweet. Get a copy if you want, and support/nurture the tiny (or maybe sizeable) angry vegan feminist that lives deep inside your gut. 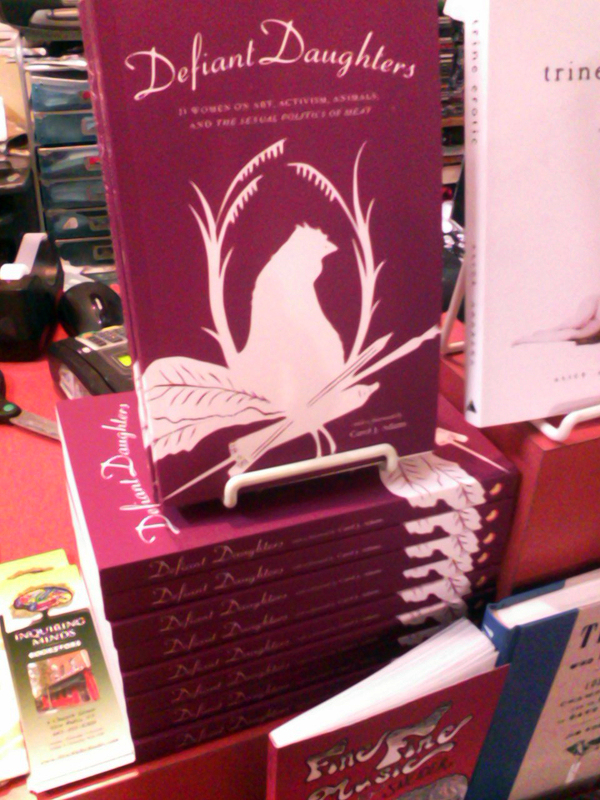 I'm reading this Friday night at Bluestockings In New York City for the Defiant Daughters book launch at 7pm! Jasmin Singer, Vidushi Sharma, Lagusta Yearwood, and Carol J. Adams are also reading! Should be great.